Officials from Walt Disney World Resort has revealed more details about its upcoming attraction, the Disney Skyliner. 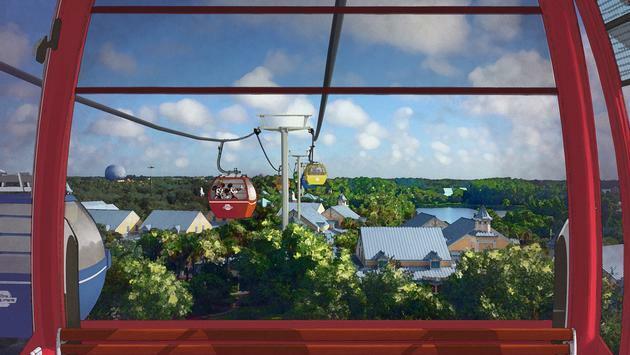 According to the Disney Parks blog, the construction of the much-anticipated gondola system is “making progress,” but the theme park has yet to announce an opening date. The Disney Skyliner will connect Hollywood Studios and Epcot to four nearby resort hotels, including the Art of Animation Resort, Pop Century Resort, Caribbean Beach Resort and the upcoming Riviera Resort. The construction process for the Disney Skyliner includes building loading stations that complement their surroundings, erecting support towers around the resort and laying the groundwork for the gondolas’ reinforced cables. You all know that the Haunted Mansion is the favorite attraction of The Mature Mouse™. In honor of Halloween, here is a great article from Disney Parks Blog. Did you know that the Haunted Mansion’s cemetery queue contains hidden references characters who were created for the attraction, but cut before the final version? That’s the topic our Imagineers look into in today’s celebration of the Haunted Mansion at Magic Kingdom Park. 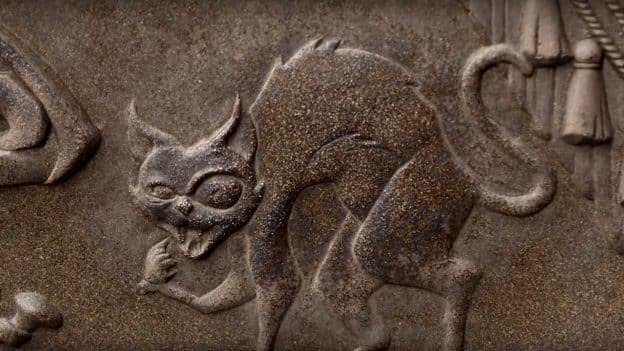 One such character guests can spot as they travel through the queue is a mysterious one-eyed cat, who was intended to appear in the attraction and would’ve been a figure the Ghost Host would warn you about as you traveled through the mansion. 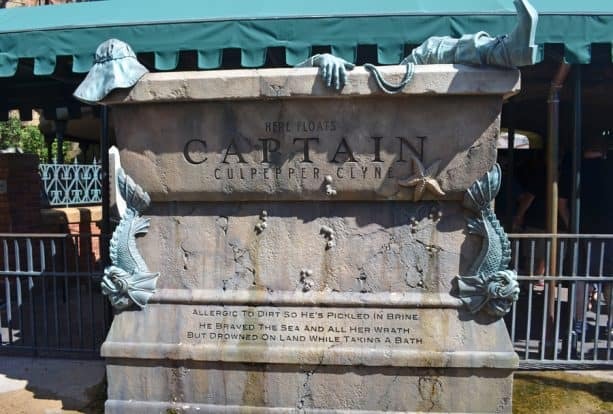 Another is Sea Captain Culpepper Clyne, whose tomb you can find inside the cemetery, is a nod to an affect and a character originally created for the attraction by Disney Legends Rolly Crump and Yale Gracey years ago. In that version of the attraction, guests would encounter a sea captain just before a spooky ghost would materialize nearby. Both the one-eyed cat and Sea Captain Culpepper Clyne were cut before the final version of the attraction took shape. Check out the video above, in which Imagineers Steve Vagnini and Daniel Joseph share all the details! The Mature Mouse™ first visited Walt Disney Word during the summer of 1972. It took 42 years before I would make my way back home. Walt Disney World is in the throes of change, with major additions and modifications set to open by and after the 50th Anniversary in 2021. Are you looking forward to all the changes coming to Walt Disney World? Walt Disney: Here in Florida, we have something special we never enjoyed at Disneyland: the blessing of size. There’s enough land here to hold all of the ideas and plans we can possibly imagine. How do you stay connected to the Magic of Disney Parks in between your trips home? One Disneyland fan has recreated elements from the park in his basement. The new online vacation-planning destination features park offering overviews, travel tips from Disney Parks Moms Panelists and customized suggestions based on each guest’s personal preferences – helping guests make more informed decisions. Follow the above link to Disney Parks Blog for the full article. Walt built Disneyland for the entire family. Disney Parks are not just for kids. The Mature Mouse™ has discussed this many times. Walt Disney World has developed into a destination, as large as the city of San Francisco. Imagineers are constantly adding more more lodging, activities, and entertainment that appeal the adult traveler. This article, from Disney Rewards, takes a look at the grown up, mature, adult oriented side of Walt Disney World. When people say Walt Disney World® Resort has something for everyone, they don’t just mean kids of all ages—they mean adults too! From world-class cuisine and cocktails to R&R that will recharge the mind and body for serious fun, here are just a few fun ways to plan your getaway out of the world of “adulting” and into vacation mode. Ready to take a walk on the wild side… literally? The only thing more thrilling than an animal encounter on Kilimanjaro Safaris at Disney’s Animal Kingdom® is the VIP access and adventure Guests can find “off-road” on Wild Africa Trek, an exclusive hike through an environment modeled after untamed African terrain. Walk along the grassland, cross a rope bridge and ride in a rugged safari vehicle over an open savanna – viewing African animals like giraffes and hippos. Do your taste buds savor the new and exciting? During this year’s Epcot® International Food & Wine Festival, you can roll up your sleeves for a hands-on culinary lesson with chefs and beverage experts. Attendees of Mix It, Make It, Celebrate It will learn to whip up sweet treats, savory sensations, and pair with cocktails, spirits and wines. Step onboard the iconic attractions you know and love, whether it’s the chills of Haunted Mansion and Pirates of the Caribbean, the twists and turns of Space Mountain or Rock ‘n’ Rollercoaster Starring Aerosmith, or the ultimate drop with The Twilight Zone Tower of Terror. Want to combine nostalgia with the all-new? Become the size of a toy alongside Woody, Buzz Lightyear, Jessie and the rest of the gang at Toy Story Land—all in the so-much-larger-than-life setting of Andy’s backyard. Being an adult means never having to read the “You Must Be This Tall” signs again, but it still takes a bit of courage to reach the heights of Walt Disney World Resort’s newest, most innovative attractions. Climb to the “peak” of excitement on Expedition Everest, take a breathtaking 3D voyage on Avatar Flight of Passage, and experience intergalactic awe and new destinations on Star Tours – The Adventures Continue. Get in the “aloha” spirit at Trader Sam’s Grog Grotto, the popular watering hole that’s adults-only after 8 PM. Sit out in the open air or inside the lounge, sip flavorful cocktails straight out of an island paradise (including spiked Dole Whips, an adult twist on a classic treat) and keep your eyes peeled for eye-popping surprises whenever certain drinks are served. Plus, it’s adjacent to Disney’s Polynesian Village Resort, placing it a short stroll away for Guests who feel like staying in a tropical state of mind! If culinary delights and crafty cocktails are always on your mind, we have an idea that will really throw you for a loop: the Highway in the Sky Dine Around, a dining experience along the world-famous Monorail. Providing five courses across three different Resort destinations, this classy “commute” brings you delectable views and a one-of-a-kind ride to go with savory and sweet dishes and world-class cocktails. Looking to dance after dinner, indulge in some “shopping therapy,” or wine and dine with options inspired by award-winning chefs and a Master Sommelier? Take a stroll through Disney Springs® and you’ll find all this and more in store. International apparel, accessories and cosmetics, snacks and sweets, and entertainment like bowling, movies, and live music are just a few of the possibilities to choose from. After dark, you can kick the night into high gear with themed bars and nightlife from all over the world, including The Edison, and spots exclusive to the Springs, including Jock Lindsey’s Hangar Bar. With all these possibilities and more, it’s a good time to remember one of the great things about being an adult: you get to make the decisions!